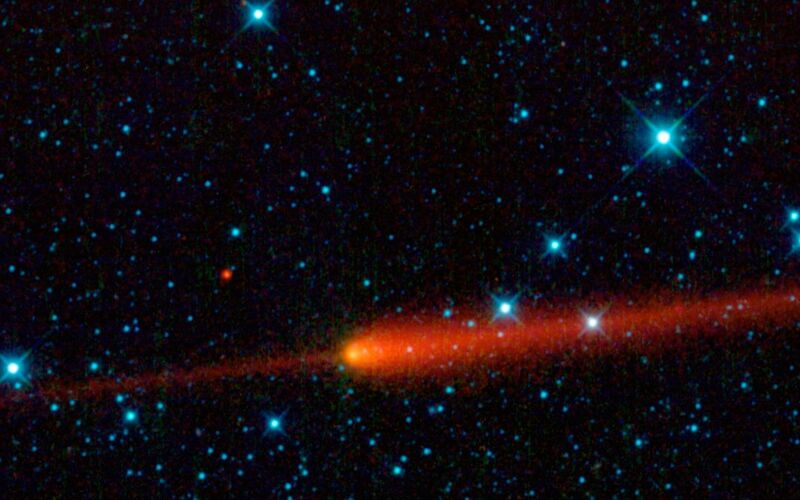 This image from NASA's Wide-field Infrared Survey Explorer (WISE) features comet 65P/Gunn. Comets are balls of dust and ice left over from the formation of the solar system. 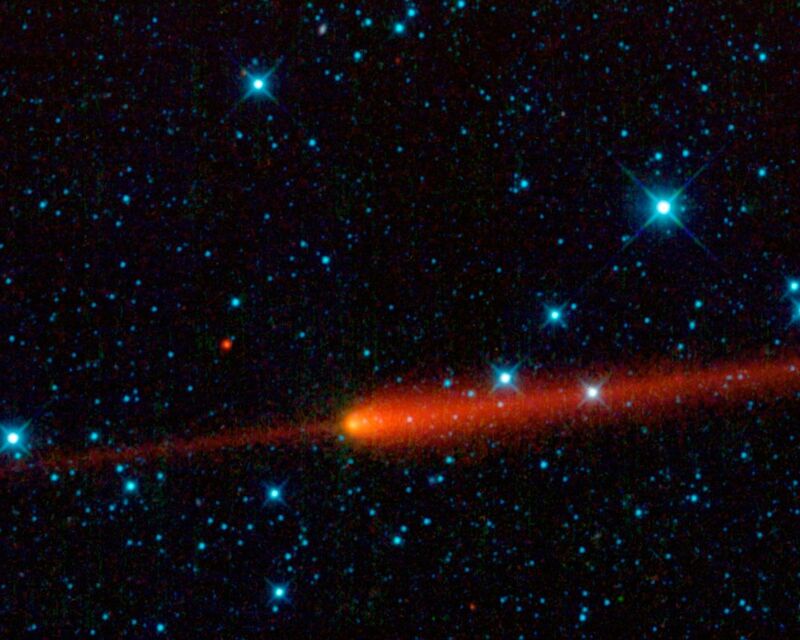 As a comet approaches the sun, it is heated and releases gas and dust from its surface, which are blown back by the solar wind into a long, spectacular tail. 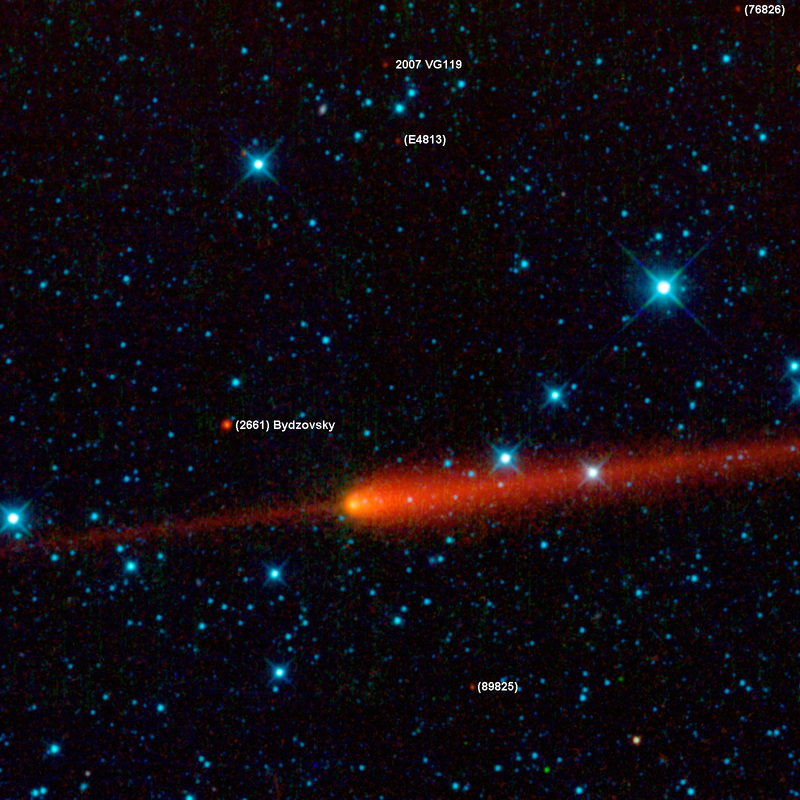 Comet 65P/Gunn's tail is seen here in red trailing off to the right of the comet's nucleus (near the center of the image). Comet 65P/Gunn was discovered by James Gunn, a professor at Princeton University, N.J., in 1970. Gunn is the project scientist for the Sloan Digital Sky Survey, another important survey of the sky done in visible light. 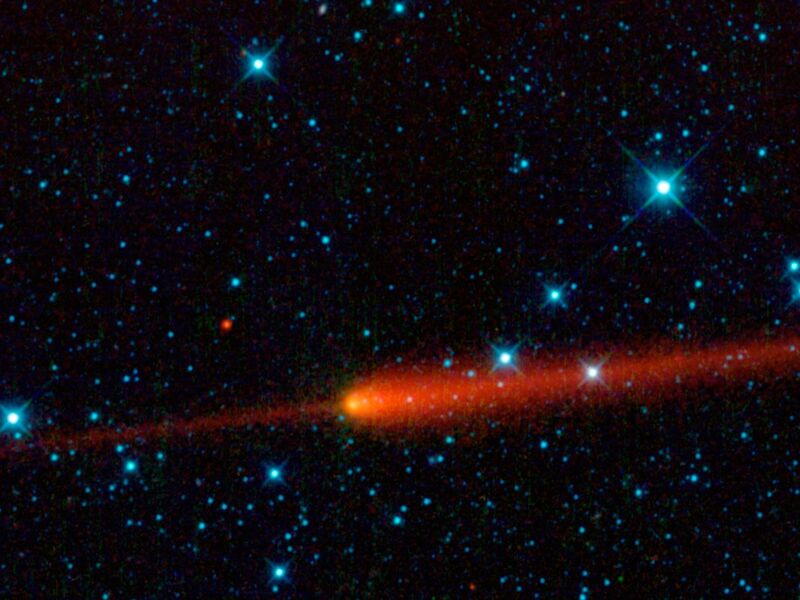 WISE observed the comet on April 24, 2010, in the constellation Capricornus (just one month after the comet's closest approach to the sun). This is a single-frame observation, covering an area of 1.5 by 1.5 full moons (0.76 by 0.76 degrees). Comet 65P/Gunn is what is called a short-period comet. It orbits the sun inside the main asteroid belt between the orbits of the planets Mars and Jupiter. The orbit of 65P/Gunn is relatively round compared to many comets, and it takes 6.79 years to complete one trip around the sun. At the time that this image was taken, the comet was at a distance from Earth of 392 million kilometers (243 million miles). For reference, the average distance between the Sun and Earth is 150 million kilometers (93 million miles). The comet's speed relative the sun, when this picture was snapped, was about a whopping 7,700 kilometers per hour (4,800 miles per hour). 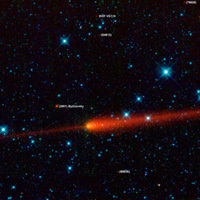 Just ahead of the comet is an interesting fuzzy red feature that makes it look something like a swordfish, or narwhal. This "sword," or dust trail, is made of dust particles that have previously been shed by 65P/Gunn as it orbits the sun. The dust is warmed by sunlight and glows in infrared light. 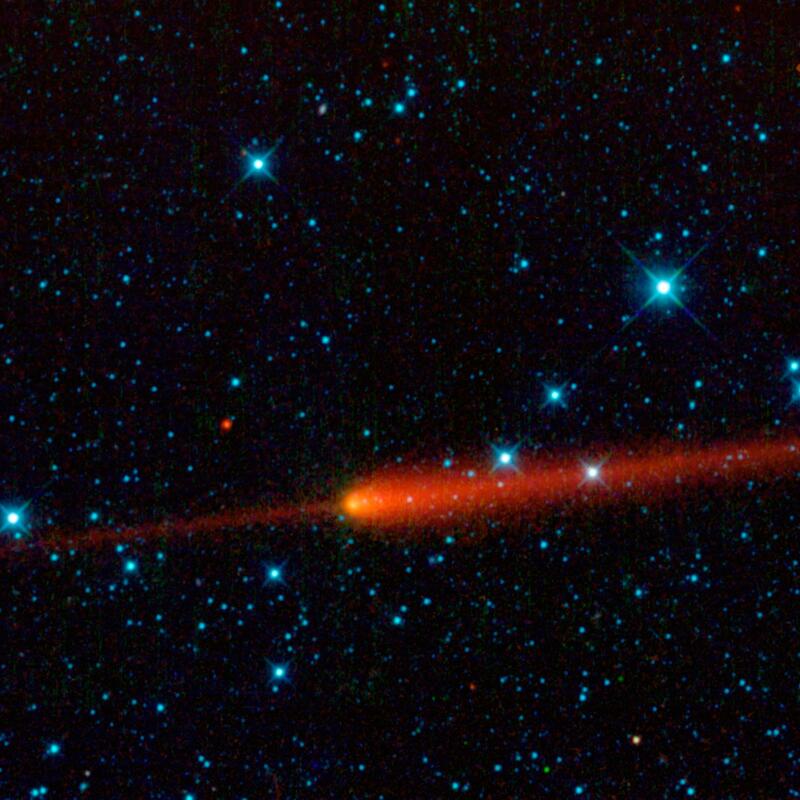 Trails appear both ahead and behind the comet's nucleus and have a narrow, contrail-like appearance. They represent the first stages in the evolution of meteoroid streams. Over time, the material in the debris trail can drift away from the comet's orbit and become clouds of debris that will be seen as meteor showers if Earth passes through them. Also visible in this image are several asteroids -- chunks of rock and metal leftover from the formation of the solar system -- all of which orbit the sun in the main asteroid belt. Asteroids are much cooler than stars and appear red in this image. The most prominent asteroids in the image are: 2661 Bydzovsky; 89825; 76826; E4813; and 2007 VG119. WISE sees invisible infrared light, and all four infrared detectors aboard WISE were used to make this image. The colors are representational. In this image, 3.4-micron light is colored blue; 4.6-micron light is green; 12-micron light is orange; and 22-micron light is red. Bluer objects in this image are warmer in temperature, such as stars, while cooler objects, such as asteroids and the comet, are redder in appearance.